Bilimbi, or averrhoa bilimbi, has the local name of bhimbli in Goa. The tree is about 5 to 10 metres in height and has leaves in the pinnate formation. It is a tropical tree that grows easily in India. The sour tasting fruit is oblong shaped and yellowish green when ripe. The fruit has culinary uses as it is utilised in preparations of curry and is also eaten as a pickle. A paste of the bilimbi leaves can reduce itching, and soothe skin eruptions and swelling. The flower can be soaked in water and consuming the water helps alleviate cough and cold. Drinking a decoction of the leaves will give relief to rectal inflammation. 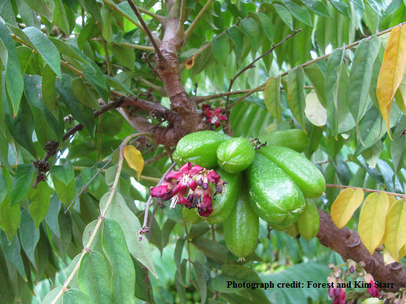 The leaf extract of bilimbi may have a positive effect on lowering glucose levels in diabetic patients. Caution: While the high amount of oxalic acid in the fruit makes it an excellent cleaning and bleaching agent, overconsumption of the fruit or its juice can lead to acute renal failure. Ingredients: 1 ½ to 2 kg chicken (uncut and with the skin), 3 tbsp of oil, mixed herbs and ½ tsp of salt. Preparation: Preheat the oven at 220°C for 15 minutes. Clean the chicken and sprinkle salt, herbs and oil all over the chicken. Place the chicken in a baking pan in the oven and let it roast at 220°C for 10 minutes then reduce the temperature to 180 degrees. Let it roast for ¾ of an hour and check in between for dryness. If the chicken is dry, you can take the oil in the pan and pour it over the chicken. When the chicken gives out its own water and oil, remove a part of it for the brown gravy that goes with the roast chicken. Ingredients: ½ a kg of potatoes, 100 gm of cheese spread, 50 gm of butter, 50ml of milk, 100 gm of cream, 1tsp of chopped coriander leaves, 5 freshly crushed black peppercorns and ½ tsp of salt. Preparation: Peel and boil the potatoes (add the salt while boiling) for 25-30 minutes on a high flame. If the potatoes are large, you can quarter them so that they soften evenly. Mash the potatoes and add the milk, butter, cheese spread and cream one after the other ingredients. Finally add the coriander and mash well. Ingredients: 150 gm of cauliflower, 75 gm of peas, 75 gm of corn, two medium sized carrots, 150 gm of French beans, a pinch of mixed herbs and ½ tsp of salt. Preparation: Add vegetables, salt and mixed herbs to the water and boil for 20-25 minutes. Drain the water and keep it aside after the vegetables have boiled. Ingredients: 6 tbsp of wheat flour, half a cup of port wine, a pinch of mixed herbs, water from the vegetables, fat from the chicken, one Maggi cube, a pinch of pepper and salt. Preparation: Mix the port wine, wheat flour, Maggi cube, mixed herbs, pepper and salt in a cup. Heat the fat from the chicken in a small saucepan and add the mixture of port wine and other ingredients to the fat, stirring it in quickly. Add the water from the vegetables gradually and keep stirring (for about 10 minutes) until it is the right consistency. Add more water if needed. Corns: To get rid of painful and annoying corns, apply a paste of raw papaya to the corn twice or thrice a day. Sunburn: You will get relief from sunburn if you apply cloth soaked in cooled tea water to the affected area.